Recently I was plying around with creating some snowflakes in After Effects. I tried few approaches – creating design in external program like Flash, Illustrator or Photoshop then bringing it in to AE, as well as doing all the steps inside After Effects. The second method proved to be quite effective in producing custom snowflake patterns and variations (fast!) and it’s quite fun. Basically, you recreate a kaleidoscope effect to create the designs. I tried CC Kaleida at first, but it didn’t work for me. 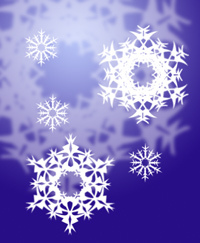 Render out a still image of your snowflake and import it back to AE for use in the final composition. To create different designs, just add more layers to the first comp (base element) with different mask shapes, hide other layers. The rendering stills step is optional, it just speeds up the processing. If you have a powerful system (I don’t) you can keep all the elements live – just duplicate the base element and snowflake comps as needed. Then you could animate each individual snowflake pattern on the fly as well. This entry was posted in After Effects and tagged After Effects, Snowflake. Bookmark the permalink.